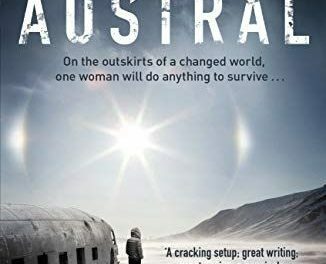 AUSTRAL by Paul McAuley. Review. Science Fiction has long been a vehicle for warning about the effects that mankind’s actions or inactions can have on the state of our planet. The problem is that the dire warning does not always reach the people that could actually remedy the situation. SF readers, as well as most of the scientific community, are very much aware that global warming and climate change is a real problem. Kim Stanley Robinson’s trilogy that began with Forty Signs of Rain gave us symptoms and a means to act. Later books, like New York 2140 takes the world beyond the tipping point and deals with the aftermath of not doing enough soon enough. The setting for Paul McAuley’s Austral is another future where the tipping point has passed but in this case, all the attention is focused in the southern hemisphere, principally Antarctica. The ice has retreated a long way and areas of the Antarctic Peninsula have been colonised, the continent having been opened up for settlement. Groups of people, colloquially known as ecopoets, have been greening the Peninsula by planting trees and bioengineering animals to survive in the still harsh environment. The rich mineral resources have made commercial development viable. 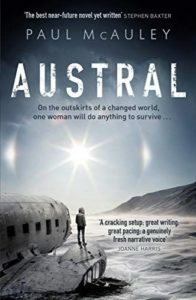 The story is narrated by Austral. She is the daughter of ecopoets but has been gene-edited to increase her survival rate in the climate. She and others like her are referred to as huskies and are regarded as second class citizens without all the rights others have. As the novel starts, she is working as a corrections officer (CO) at Kilometre 200, a work camp building the Trans-Antarctic Railway. Most of the workers are criminals serving their sentences by doing hard labour. The discipline is relatively lax and Austral is in a relationship with Keever Bishop, one of the cons. Austral has just discovered that she is pregnant and is telling the story for her daughter. Keever is planning to escape as he is in line for extradition to Australia. He gives her the instructions to create a diversion but Austral doesn’t follow them and ends up being on the run with Kamilah Toomy. She and Austral share a grandfather, Eddie Toomy who was an opportunist who acquired wealth by the exploitation of the peninsula. Fleeing across country, Austral is following the route she took with her mother when they had escaped from Deception Island. They and other ecopoets had been rounded up and dumped there due to the influence of Eddie, his motive – to get rid of his illegitimate son and his family. Effectively, they were prisoners. Now, Austral uses her memory of ecopoet refuges and survival skills to keep the two of them alive. Austral has had a dream to get to Australia and make a life for herself there. Her idea is to ransom Kamilah for the cost of passage aboard a smugglers ship. Keever has other ideas and sends his cronies out to hunt them down. Too many people ignore the claims about Climate Change and no amount of evidence, proselytising or loud shouting is going to change their minds. McAuley’s skill is to show the effects without belabouring the point. The setting may be the Antarctic but it is very much not the one we would recognise. Rising sea levels have flooded coastal cities but to the characters here, it is not important, very much as too many of the current population don’t recognise what is happening in other countries as relevant to them. Despite the desire to have a crusading novel, McAuley has adopted the approach that we are all human and our concerns tend to revolve around our own desires rather than make world wide waves. Because he is such a skilful story-teller, the effects of climate change are insidious and the reader cannot go away without some after-taste of the probable scenarios. There will always be greedy people and corruption. More than anything though, this novel is about prejudice. Most of Austral’s problems stem from the genetic modifications that were engineered into her DNA. The intention was to create someone who was adapted for the harsh climate, but the result is to have unmodified people see her as a monster and inferior. The gene editing to create huskies like Austral was not confined to humans but was started by the ecopoets to create species of plant, and later animals that could colonise and thrive in Antarctica. This has been one of the themes that occurs in McAuley’s work particularly in The Quiet War series. Although this is set out in the Solar System the idea of modified humans, climate change making Earth uninhabitable and plants gene-edited to grow in a vacuum are explored. While the ethical considerations of this approach are very low key and portrayed as beneficial the opposition is present in the background. With the current claims from China of gene-edited children, this is likely to receive greater prominence. Overall, Austral is an extremely well-crafted book dealing with real people with real concerns and is well worth reading.